Basics: The 10-20mm focal range gives you horizontal angle of views from 61 to 99 degrees on a D300 or other similar DX sensor body; that's effectively the same as using an 15-30mm lens on a 35mm film or FX sensor body. Even at the long end of its focal range the Sigma is still in wide angle territory. Indeed, it goes from "very wide angle" to "wide angle" to "modestly wide," covering pretty much all the wide-ness you might need. This is a two ring design—the zoom ring is nearer the camera and the focus ring is almost at the front of the lens (i.e. the traditional positions on zoom lenses). The lens extends very little with zooming, and not at all with focusing. The lens has a distance scale, but with no depth of field or infrared markings. Optically, the Sigma lens is modestly complex, with a 14 element design in 10 groups. It has three aspherical elements and three SD (low dispersion) elements in the design, which is where most of the optical complexity lives (aspherical elements often cause linear distortions that are not, well, linear). One eye-brow raising design choice is the six-blade aperture diaphragm. However, I will say this: unlike many aperture openings I've seen lately, the Sigma keeps its geometric shape perfectly. Moreover, at the wider apertures (f/4-f/8) it either is fully curved or slightly curved in the opening. The unlabeled hood supplied with the lens is the bayonet type butterfly style. It can be reversed onto the lens for carrying, but it adds significant diameter to lens when you do so (and covers the focus ring, so you won't be tempted to use it this way ;~). It's pretty thin at the side openings, but it does make a difference, so you should always use it, if possible. You get Sigma's wave motor operation with this lens (HSM), which is similar to AF-S, and that focusing will take you down to a little under one foot (.24m, or about 9" for us American blokes). The supplied lens cap is now [spring 2008] a pinch-front type, and easier to remove/replace when the hood is on. Handling: I had no real complaints about the build quality of this lens. To be honest, I absolutely abused it when it first came out. It was stuffed in backpacks unwrapped, it was dragged across rock and dirt, it was exposed to sea spray more times than I can count, and it had more frequent flyer miles than 99.9% of the folk reading this review. In the end, it didn’t exactly look new any more, but it also didn't show the wear and tear some of my long-use lenses do. The zoom ring is thin and stiff, though there's no "hitch" in the turn like you feel with some lenses. You can't exactly finger roll the zoom on this lens, but that's not a big drawback, as you rarely do that with really wide lenses. While there's a small difference in "feel" of the two rings, both rings use a similar stripe pattern. Fortunately, the rings are enough apart that you're not likely to confuse one with the other, as you can on some lenses. Unlike many focus rings, the Sigma's feels quite smooth. From near to far focus is almost a half turn. Despite what some others have written, I find the Sigma a little more tempremental about filter thickness than my Nikkor 12-24mm. I've moved to thin filters with it, but you should note that the Singh-Ray Vari-ND filter—even the thin version—will vignette at 10mm on this lens. That's a bummer in my book. The lens balances very nicely on a DX DSLR. Nor does it stick out as much as the Nikkor. Moreover, the lens stays short at its shortest focal, unlike the Nikkor. Distortion: Things are a little different for really wide angle lenses. One of the problems that's encountered is unpredictable (or perhaps non-linear is a better word) distortion. At 10mm, this lens has something akin to what's called mustache distortion. At the edges, there's visible barrel distortion while in the center there's almost no visible distortion though there is a small bit of distortion that varies between barrel and pincushion. This is one of the side effects of using quite a few aspherical elements for wide angle lens design. The problem is that such distortions are difficult to remove from the picture. By 14mm, the lens is producing just barely visible pincushion distortion, and at 20mm that has lowered to being essentially invisible. Overall, the distortion handling is much better than you'd expect for such an extreme lens, as at all focal lengths the amount is relatively low. The primary problem is that at 10mm the distortion does become visible at the edges of the frame and is difficult to remove. Sharpness: Apparently there's some sample variation with the 10-20mm, something I've encountered with a lot of Sigma lenses. Mine tests decently, but I've also encountered one that tests less well. Note: these assessments were done with 12mp cameras, and looked at briefly with 16mp cameras. With the latest and greatest 24mp cameras, the corner “fairs” are slipping towards “poor” and the corner “goods” towards “fair.” Center performance is still very good to excellent with both lenses with 24mp DX cameras, though. The Nikkor really is let down by its corner performance wide open at the widest focal length. As I've noted before, from 18-24mm it's a very strong performer, one of Nikon's best. Aberrations: At anything other than the widest focal length, chromatic aberrations are pretty well controlled. When you measure within Imatest you're looking for the average pixel width. For the longer focal lengths, that tends to remain under one pixel for much of the frame, which is what I'd call more than adequate control for a wide angle lens. At 10mm, chromatic aberrations actually increase as you stop down and are worst at the optimal aperture for sharpness (f/8). In the absolute corners I was measuring numbers in the mid-two pixel range at f/8 and 10mm. But I don't know of a lens with this much angle of view that does better. And the problem is more pronounced on high contrast edges (which is what Imatest measures) than it is for the real life objects I tend to shoot. Expect to learn how to use the chromatic aberration controls in your raw conversion software if you use this lens much at 10mm. By comparison, the Nikkor does less well at 12mm wide open at the shorter focal lengths, but better by f/8 and at the longest focal length. Light falloff: I'm not overly happy with the vignetting performance. I'd call it mid-pack at best. Wide open you're going to see between a stop and a stop-and-a-third of vignetting, depending upon the focal length (it does better at longer focal lengths, worst at 10mm). Vignetting never becomes a non-issue with this lens, as I always find more than a half-stop of it no matter what focal length and aperture I use (i.e. out to f/11). Still, like chromatic aberration, most recent raw conversion programs allow you to adjust for vignetting, so the higher-than-liked vignetting isn't a fatal flaw. Again by comparison: the Nikkor 12-24mm is about the same as the Sigma wide open, but is much more usable at smaller apertures. By f/8 there's only about a third-of a stop of vignetting at any focal length. Focus: It's an HSM lens and focuses just like an AF-S lens for the most part. Not that I use it in autofocus much, but it does snap to focus and doesn't hunt. Flare: I had no really bad problems with this lens (I should note that I always used the supplied hood). It does as well as you can expect a lens like this to perform, given that huge front element. Essentially, don't shoot into the light source and it is fine. However when you do get visible flare points in the lens they tend to have a large degree of bright green in them, which can be distracting. At the extreme, you often get a narrow rainbow-like flare spot well away from the light source itself, and which has a long, very visible green component. By comparison, the Nikkor produces a larger flare spot much closer to the light source, but somewhat more subdued in color. One other note on shooting into light sources: the six-blade aperture of the Sigma produces a much less interesting diffraction pattern at small apertures when a bright source like the sun is put behind the edge of a near object. Overall: As many of you have noticed, the 10-20mm Sigma replaced the 12-24mm Nikkor in my bag for awhile (almost two years). You're probably wondering why, as none of the performance points (other than autofocus, which I rarely use) are stellar with this lens. Well, they're not stellar with any other lens that goes that wide, either. Consider that we're at the FX equivalent of 15mm. 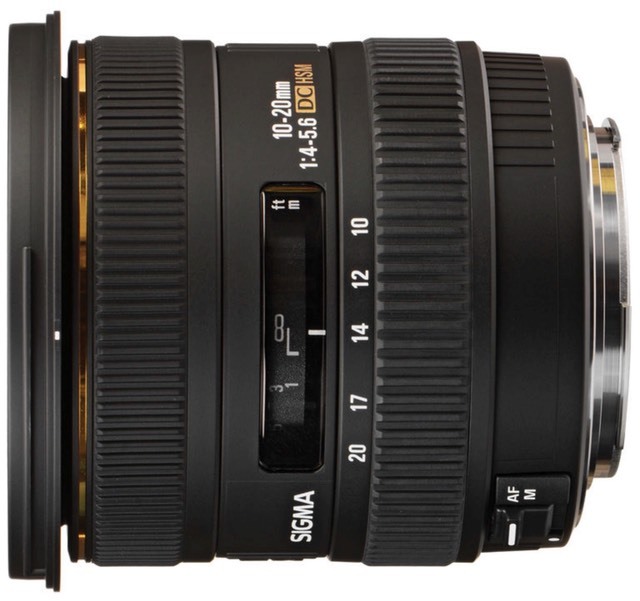 That means you have to compare this lens at 10mm to an FX body using the 14-24mm Nikkor or perhaps the 14mm Sigma I've reviewed before. And you know what? When you come at it that way, you discover that the Sigma 10-20mm is near the best of the wide angle bunch for DX-framed camerasThe Nikkor 12-24mm and even the Nikkor 10-24mm are clearly better lenses at 20mm, but at 12mm I would lean slightly towards the Sigma even though the test results would say the slight advantage is still Nikon's (plus, of course, I can go 2mm wider, which is significant for the DX frame). Vignetting and chromatic aberrations are easily dealt with in software these days, so it really boils down to corner sharpness at 10mm for me: is it good enough to be usable? And the answer is, yes, stopped down to f/8 or f/11. A strong performer on 12mp and 16mp DX bodies, an adequate performer on 24mp DX cameras. What about the f/3.5 version? A mixed bag, really. I’d tend to say that unless you absolutely need the additional light (i.e. shoot wide open a lot), it’s not better than this lens.